Skycity Cinemas has installed wireless access points in its plush Gold Class cinemas in Auckland and Wellington, so waiting staff can take orders via PDAs and wirelessly transmit them to the kitchen. Staff can now take drink and food orders from the customer’s seat at any time during a film, says Jason Peperkoorn, IT manager for Skycity Cinemas. Both cinemas run a point-of-sale system using Microsoft SQL Server. The PDAs, running Vista Mobile, connect to the kitchen and the POS system via wireless-managed access points. As soon as an order is punched into the PDA, it comes up on the POS system, says Peperkoorn. Kitchen staff then prepare the order straightaway and the waiter collects it and delivers it promptly to the customer. The main reason for installing a wireless system was to improve service levels, by minimising re-keying mistakes, as well as increasing the efficiency of the service process as a whole, says Peperkoorn. The layout of Auckland’s Skycity Cinema building presented one of the project team’s biggest challenges, as the preparation and service areas are completely separate, says Peperkoorn. “The architecture of the building is operationally constrained. Our biggest issue was getting the right level of coverage over the entire path that the staff take in their movement from one area to another,” he says. Another challenge was getting the staff to buy into the new way of doing things. “The staff was so used to the manual, paper-based system that a major hurdle was to get them to adopt this new technology,” he says. “The direct benefit for them was a reduction in ordering mistakes, helping them do their jobs more effectively and with greater confidence,” he adds. 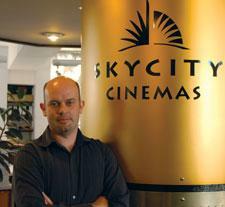 Skycity Cinemas chose network solutions provider D-Link for the job. “We had not dealt with D-Link before and, while we looked at other solutions, D-Link provided by far the best security and value for money,” says Peperkoorn. Peperkoorn runs a relatively small IT team, so simplicity of installation, configuration and maintenance was vital. “D-Link’s solution gave us this, while still providing a very secure wireless solution… [that operates in] a large and structurally complex environment,” he says. The installation took only a day and was completed by D-Link partner Infinity Solutions, says Peperkoorn. Skycity Cinemas also plans to install hot spots, so customers can access the internet in its Gold Class lounges. The company is opening another Gold Class cinema, in Albany, north of Auckland, in December. This will also be equipped with wireless technology. A long-term goal is to move to a wireless EFTPOS system, which would mean customers paying by credit card would not have their card swiped.